1. What is algorithm trading? In electronic markets, algorithm trading or automated trading, also known as algorithmic trading, algo trading, black-box trading or robo trading, is the use of computer programs for entering trading orders with the computer algorithm deciding on aspects of the order such as the timing, price and quantity of the order, or in many cases initiating the order without human intervention… Algorithmic trading may be used in any investment strategy, including market making, inter-market spreading, arbitrage, or pure speculation (including trend following). The investment decision and implementation may be augmented at any stage with algorithmic support or may operate completely automatically (“on auto-pilot”). 2. What is day trading? Day trading is the practice of buying and selling financial instruments within the same trading day, so that all positions are usually closed before the market closes for the day. Traders who participate in day trading are called active traders or day traders. The most commonly day-traded financial instruments are stocks, stock options and currencies, as well as a host of futures contracts, such as equity index futures, interest rate futures, and commodity futures. Day trading used to be the preserve of financial firms and professional investors and speculators. Many day traders are still employees of banks or investment firms who work as equity investment and fund management specialists. However, the advent of electronic trading and margin trading has also made day trading increasingly popular among casual traders who work from their homes. EasyLanguage® is a powerful and flexible proprietary technology developed by TradeStation® Technologies, Inc., an award-winning broker-dealer for active institutional and individual traders. It can be used to describe an individual trader’s trading rules – such as when to enter and exit the market – in simple, English-like statements and trading terms that are very similar to the way they would be described to another trader. It can also be used to automate almost any trading strategy, including multiple conditional entries and exits, profit targets, protective stops, trailing stops, etc. Back-testing is a common and methodologically accepted research approach for evaluating a strategy, theory, or model by applying it to historical data. It can be used to study how a trading strategy would have performed in past stock markets. One key element that differentiates back-testing from other forms of historical testing is that it calculates how a strategy would have performed if it had actually been applied in the past. To obtain an accurate result, the back-test replicates the prevailing conditions at the time. However, a high or successful correlation between a back-tested strategy and historical results can never prove that a theory will be correct in the future, since past results do not necessarily indicate future ones. In other words, things are always changing, but back-testing is a useful analytical and predictive tool in a world where yesterday bears some resemblance to today. This is a type of exercise that tests trading and strategy ideas under real-time market conditions and without incurring any financial risk. It helps traders and potential traders to build their confidence by allowing them to see how their ideas would perform under "live" market conditions. Optimization is the practice of fine-tuning program variables (such as stop profits, profit targets and number of contracts) in order to achieve a desired outcome (e.g. maximum net profit or highest winning percentage). With regards to futures contracts as well as other financial instruments, slippage is the difference between estimated transaction costs and the amount actually paid. Brokers may not always be effective enough at executing orders. Market-impacted, liquidity, and frictional costs may also contribute. 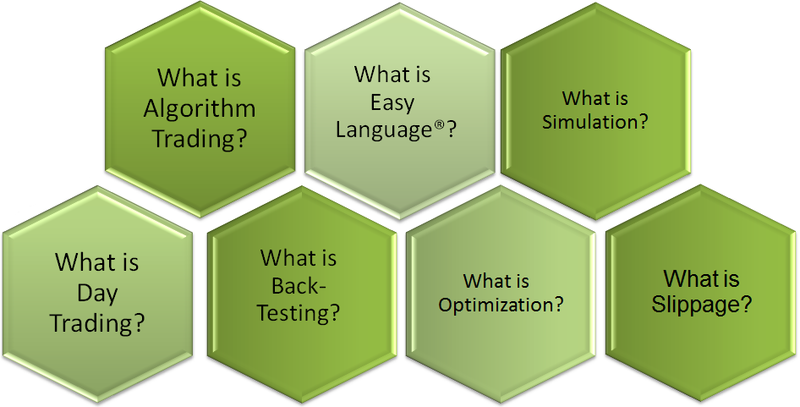 Algorithmic trading is often used to reduce slippage. Always Learn before You Trade !